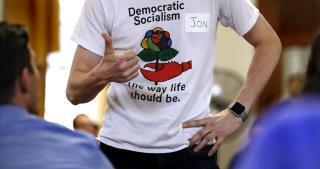 (Newser) – A week ago, Maine Democrat Zak Ringelstein wasn't quite ready to consider himself a member of the Democratic Socialists of America, even if he appreciated the organization's values and endorsement in his bid to become a US senator. Three days later, he told the AP it was time to join up. He's now the only major-party Senate candidate in the nation to be a dues-paying democratic socialist. Ringelstein's leap is the latest evidence of a nationwide surge in the strength and popularity of an organization that, until recently, operated on the fringes of the liberal movement's farthest left flank. As Donald Trump's presidency stretches into its second year, democratic socialism has become a significant force in Democratic politics. Its rise comes as Democrats debate whether moving too far left will turn off voters. There are 42 people running for offices at the federal, state, and local levels this year with the formal endorsement of the Democratic Socialists of America, the organization says. They span 20 states, including Florida, Hawaii, Kansas, and Michigan. Their key policies: Medicare for all, a $15 minimum wage, free college tuition, and the abolition of the federal department of Immigration and Customs Enforcement, also known as ICE. Vermont Sen. Bernie Sanders, Congress' only self-identified democratic socialist, campaigned Friday with the movement's newest star, Alexandra Ocasio-Cortez, a 28-year-old former bartender who defeated one of the most powerful House Democrats last month. Her victory fed a flame that was already beginning to burn brighter. Click for the full story. Are they honest about the level of taxation that will be required to have Medicare for all and free college tuition? Like a 20% VAT and higher income taxes, which is how most European countries pay for these things. If so, then they are presenting an honest choice. If not, it's just more populism. Only because liberals are too detached from reality to recognize this disease for its documented massive failures while ignoring capitialisms proven record of uplifting the masses.